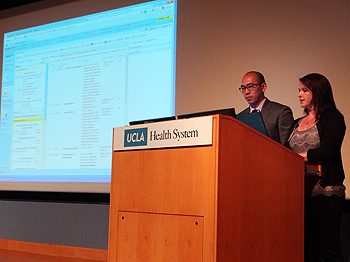 An end-to-end demonstration of nursing workflows in CareConnect sparked a lively discussion and an abundance of questions from a group of more than 80 UCLA nurses on April 18. The demo presented at Ronald Reagan UCLA Medical Center followed patient "Josephine Bruin" who was admitted to the emergency department with a fever and signs of infection. The scenario followed Josephine's encounter from the nurse's perspective from the time she arrived at the ED -- a diagnosis was made, medications and treatments were administered, a transfer to the ICU was conducted, and care plans were generated -- until she was discharged. "It gave us a great overview of how we will be using the system, how forms are generated, and how it will work from the point of view of nurses," said Proni Agarwala, RN, an administrative nurse II, who was among those who attended the demo. "We really wanted people to understand the functionality of the system," said Deidre Keeves, CareConnect operational readiness manager. 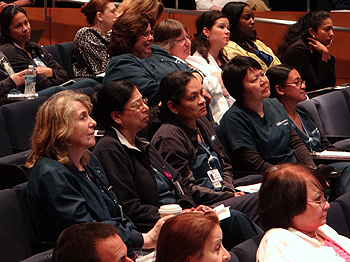 "This was the first time we were able to provide an in-depth view of the nursing tools from an end-to-end perspective. 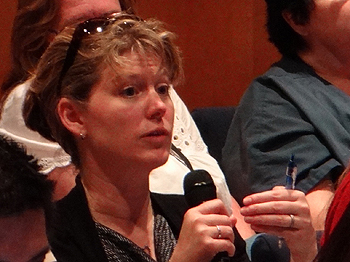 People were very engaged, and it was very beneficial to have reserved so much time for questions and answers." After a portion of the care plan was presented, the session was opened up to questions and hands shot into the air. The nurses had plenty of questions including: "Immunization records, will those be incorporated? ", "Can the items in a problem list automatically trigger a care plan? ", and, 'If medication was given in dialysis, where would you document that?" "I thought it was great that they stopped after presenting a certain portion of the visit, and answered questions instead of saving questions for the end," said Clinical Nurse Specialist Tina Mamais, who also attended the demo. "It was also nice that they were able to go back through and visually show us as well." "In general, it seemed like everyone was most concerned about whether processes would be better or worse for us in CareConnect -- compared to how things are now," Agarwala said, while adding that it seemed that CareConnect will improve most processes. Agarwala has been involved in a CareConnect work group, which reviewed and suggested modifications to flow sheets, line-by-line. Not only was she eager to see how the flow sheets had come together, she said the demo gave her an opportunity to stay informed - as she prepares to serve as a super user for her department. "I really liked how CareConnect got all of us involved, bringing all the nurses together from different departments, gathering their input to make the system user friendly," she said. Jennifer Do, RN, MSN, a nursing unit director, said while the walkthrough offered a look at workflows from a very "normal" patient visit perspective, she would have liked to see the demo with a patient scenario that was not as typical - for example, how the system would respond if conflicting data was entered. "It is very beneficial to see how the workflows will be and how our staff will be utilizing the system," Do said, as she commented on how CareConnect will improve existing processes. But she still has concerns about issues that are under consideration - such as system lockout times - as well as some things that CareConnect won't provide. "At this session, we were able to see some of the things we won't be getting. EKG scripts won't automatically show up in the system as we had hoped. We were thinking we'd be completely paperless, but it looks like we'll still be utilizing paper for certain things," Do said. 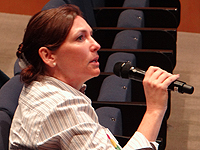 "This new system may sound complicated, but remember that the nursing practice will not change," Mamais told the group. 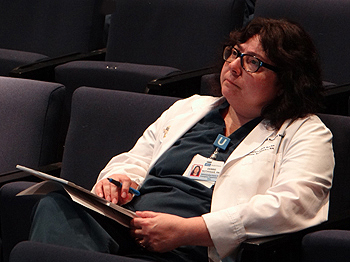 "The system is supplementing what we're doing now and is supplemental to the profession of nursing, but it is not changing the people who will be using it. It is important that the managers know how to work with the system." Additional role-specific demonstrations and Sneak Peeks will be held in the coming months. Check the Sneak Peek page for upcoming dates and additional details. Questions or comments? Visit our "Contact Us" page or send us an email at CareConnect@mednet.ucla.edu. from the nurse's perspective in CareConnect. nurse III, listens and takes notes at the demo. 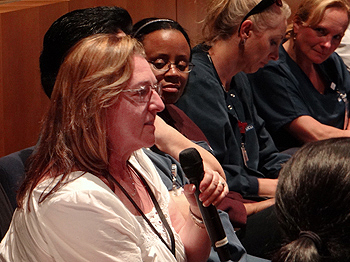 a question at CareConnect's nursing demo.